I remember Lefevres fondly from my childhood as my mother and I used to meet my Nan there for lunch. I remember the two entrances and particularly that the High St. entrance had an island window that you walked around to get to the door. The cafeteria was upstairs and near the stairs was an electric kids horse ride. It looked a bit like Muffin the Mule and I found it rather scary. Yes - I remember all the moving animals and elves etc. There was also running water that went under bridges as you walked through. That was in the early 50s. As you went up the staircase to the restaurant there was a marvellous painting on the wall depicting the pilgrims from Chaucer's Canterbury Tales which made a very great impression on me as a child. Is it still there? I remember a marvellous Grotto when I was very young (prob 1938/9) full of animals and birds and Dwarves that all moved. So when I took my little son about 1960 I was most disappointed - there was nothing like that. As far as we know, Lefevre's owned both the Gillingham and Canterbury firms until Debenham's took over. Mr Pope married into the family and was a director of both Gillingham and Canterbury - my wife remembers him visiting from Canterbury on occasions. Mr Mullins was manager at Gillingham (see 2nd photo of Reply#33). I can remember the Canterbury store was still signed as Lefevres well into the Mid 1970's, it changed 73 or 74 as a kid I was upset by the change. Did they have a vacuum system for money? Or was that Ricemans? Later in life I became a gents hairdresser and one of my customers was Mr Lefevre (Peter seems to clang the bell but it was 30ish years ago) who was the last owner of the Canterbury store. I knew nothing of the Gillingham branch. I tended not to discuss things too personal with my customers but I do remember that he was a tall, gentle and well spoken man with a lovely wife. Sentinel S4. 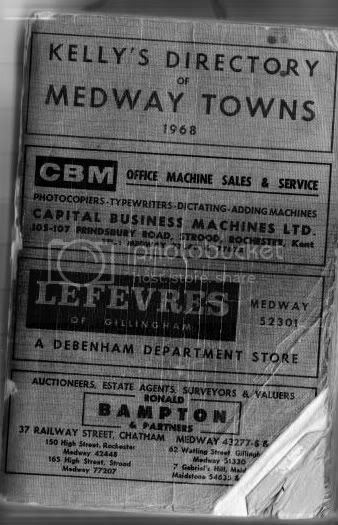 With regards to when Debenhams took over Lefevres, you appear to be correct with 1967/68. I now have Kelly's Directories for 1967, 68 & 69, and the '68 version has a front cover advert which the previous version didn't. Presumably extra cash was available for advertising after the takeover. A newspaper photo from 1954. Not very good quality, I'm afraid, but it might interest some of our members. That photo has got the nostalgia going. My wife is not in the 1954 picture because she had just become a mum, but she is in this earlier photo, together with my (then future) parents-in law (Dad-in-law was the van driver). We don’t know the date, but it was before the M&D reversed the livery of its coaches, and the advert for ‘Defence Bonds’ might provide a further clue. Manager Jack Mullins is at the extreme right and Wally Free (Furniture Dept Manager) is hanging out of the coach window. Not that the staff would dare address them as Jack or Wally – it would be Mr Mullins or Mr Free. Similarly, to the managers, junior staff would be “Miss x” and so on, or at the most informal it might be just “missy”. During the war Mr Mullins was Stores Manager/part-time Fireman, or Fireman/part-time Store Manager, whichever way you choose to look at it. My wife remembers most of the people in the photo, but only a few names – Kath Daley, Barbara Bryson, and Mr Smith (French Polisher) are three. It would be nice if somebody were to post on here something like “I recognise my aunt, or my gran”. Outings were on Wednesdays because that was half-day closing, although the shop shut for the day – Gillingham just had to manage without its premier store for that morning Destination would have been a seaside town with a store that had a restaurant that could provide a meal before coming home, and none of it – transport, meal, and morning off – cost the workers a penny. Despite the apparent formality it was a friendly organisation, and on occasions I spoke to my wife on the shop’s phone from a phone-box near my RAF station. As she says, it was a pleasure to work there, otherwise the “Follies” that started this thread could never have got off the ground. 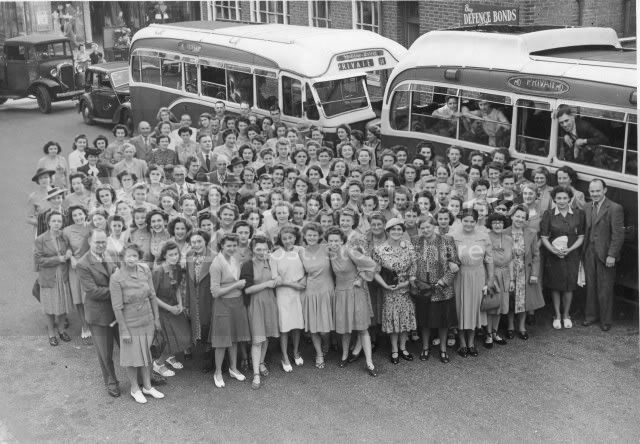 This photo is of a ’do’ at Chatham Town Hall in 1947. I worked in the soft furnishing department 1972 - 1973 in Lefevres (Debenhams) Gillingham then joined the Co-operative Insurance where I still work although I finish in June this year as home collections will finish then. I can remember the stock rooms fronting the High Street, these were still the original bedrooms of the individual shops that existed before Lefevres took them over! I used to worry that they would collapse as there did not seem to be much support from beneath. Written by Molly Proctor, published by Meresborough Books, ISBN 0948193174. It's on Amazon at the moment, as a used book - I'm not sure you can get it new these days. 48 A4 pages of text and photos. No, have you got the details, please? Have you seen the book, 'Are You Being Served, Madam? - Shopping at the Drapers in Bygone Kent.'? I never heard that there was any relationship between the Lefevres and George Fitt Motors. Doubt it. But Fitts were in the carriage trade, as it is called, for high class cars, and I imagine the Lefevres probably bought their cars from them and had a 'good deal' perhaps by buying the vans there too. Only a guess. The Lefevres lived in Kingsdown House. I have no idea where George Fitt lived but I imagine they knew each other. Pre war there weren`t that many big houses and everyone knew each other. I know my Grandmother and her husband seemed to know everyone, especially through the Seasalter Golf Club. Shame I never thought to ask her. That was the garage. It was just your mention that Mrs Lefevre (and perhaps Mr Lefevre while he was alive) lived at Tankerton that made us wonder if there was a connection with George Fitts, otherwise why not get the van locally? Just a wild guess. In fact, my wife thinks both vans may have come from there. There was a very big Garage in the main road at Tankerton - George Fitts, Motors, just up from Tankerton Circus, afterwards becoming Fitts Motors. Haven`t been to Tankerton now for 10yrs or more but there was a garage there then.